Since the dynamics of flirting on Facebook are so unique, we're bringing you a four-part series on making the most of this social media platform. On a cool fall evening accompanied by a bottle of merlot, it was only a matter of time until the conversation between co-workers turned to relationships. After a few bites of bruschetta, it became painstakingly obvious that (we’ll call her) Brianna should not be with her boyfriend. Somewhere between our appetizer and dinner, her relationship was over. And just like that, I had been taught how to break up with someone on Facebook via a simple status message. Some ladies learn the art of the twitter lash bat. Others, however, have redefined social media superiority, and when asked their status (Single? In a relationship?) have chosen to keep their virtual door open. Decline the “in a relationship with” request. 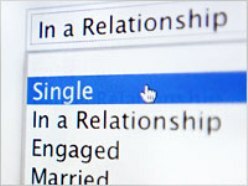 Once it’s written on digital paper, consider it official – Facebook official, to be exact. After all, if we didn’t read it on Facebook – it didn’t happen. To keep that “in a relationship” heart from popping up on everyone’s newsfeed, decline the smiley emoticon requesting the “in a relationship with” and let your link remain platonic until further notice. Untag and delete all couple-like pictures. Clear evidence of coupledom is a tagged picture. If you’re dancing around the subject, a group picture where there’s no proof of exclusive attachment is a safe bet. But beware the beast that tries to tag the exclusive one-on-one photo, which indicates some sort of budding relationship. With cellular technology making us all Gossip Girls, knock the privacy settings up a few notches and don’t allow tags unless they’re approved by you! When in doubt, opt for the clean break — at least on your end. There’s no clearer message than a simple click of a drop down menu that instantly changes your relationship from unavailable to available in a matter of seconds. An added bonus? Live feed updates will inform your former significant other and your entire social network of your single status simultaneously. Talk about social media efficiency in the dating 2.0 age! Got any of your own tips on remaining solo on this social network? We’d love to know!